Napali (or Na Pali), which literally translates to “The Cliffs,” are sea cliffs which stretch for 11 miles down the coastline of Kauai, Hawaii, USA and at points rise as high as 4,000 feet above sea level. 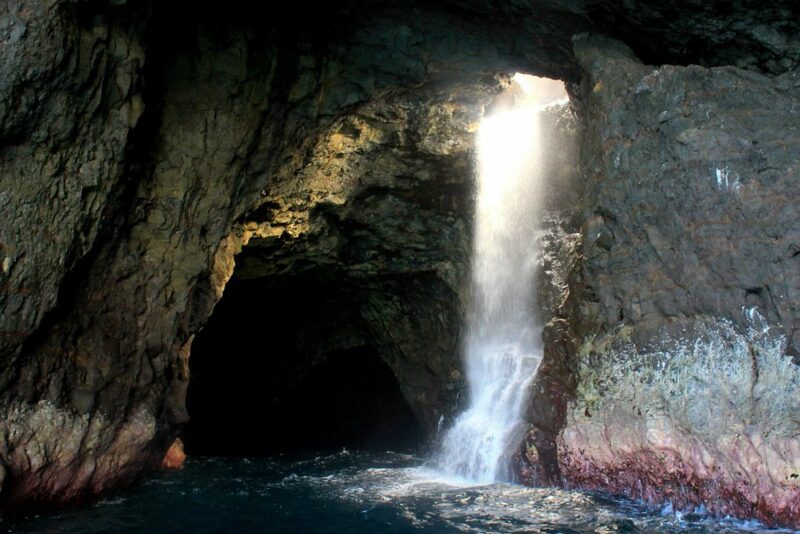 They’re also well known for their several sea caves, which means that boat tours are a great way to experience all the cliffs have to offer. My mom and I chose to do our Napali coast boat tour with the Na Pali Experience and had an absolutely blast! Out of our 10-day Hawaii itinerary, touring the Napali coast with the Na Pali Experience Boat Tour group was definitely the highlight of our trip. 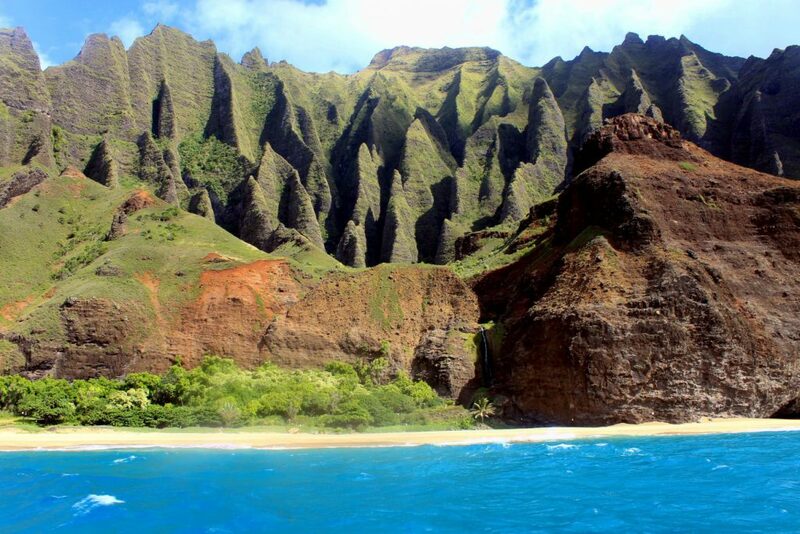 What’s Included in the Na Pali Coast Tour? Beverages and snacks, including fresh pineapple. 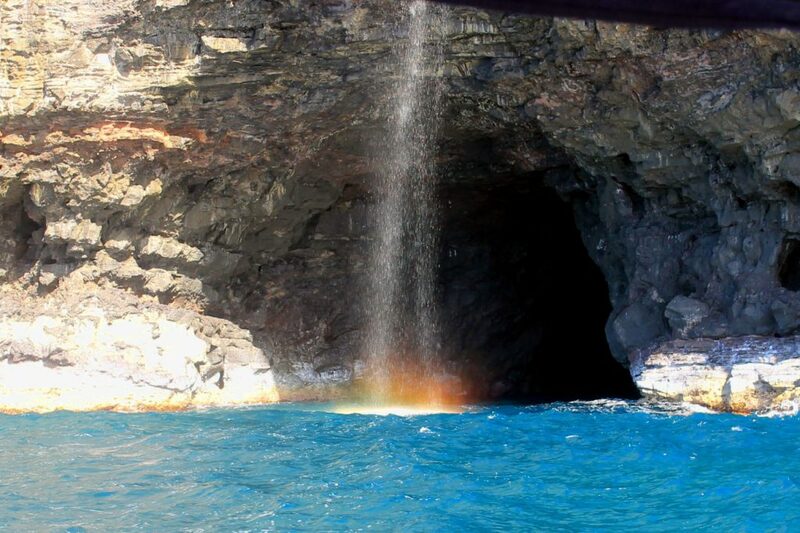 The Na Pali Experience offers three different tour times, each with their own unique features. The earlier tours, typically have smoother the waters and higher chances of encounter dolphins. While the later tours have a little rougher waters and less likelihood of encountering dolphins, they have better lighting on the napali sea cliffs and a better chance of encounter sea turtles. 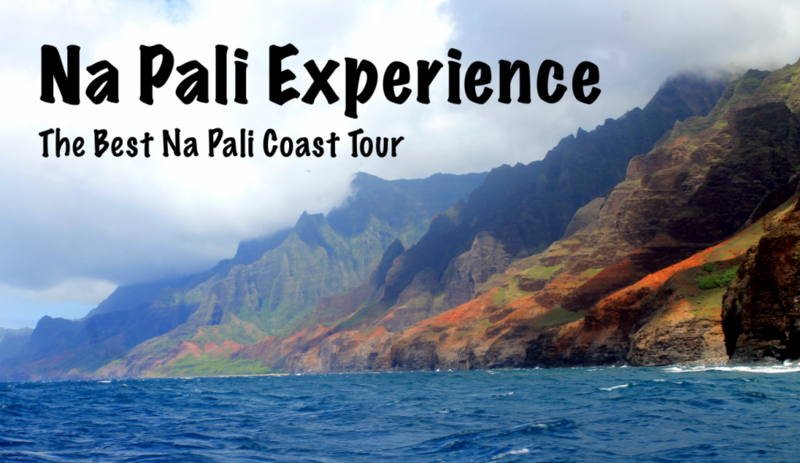 More information about the tours and prices can be found on the Na Pali Experience website. For multiple reasons, my mom and I chose to do the Afternoon Adventure. First and foremost, the Na Pali coast is absolutely breathtaking, and the Afternoon Adventure tour was supposed to have optimal lighting for photography. Secondly, we had already had an up close and personal experience with dolphins earlier in our trip, so I was more interested in getting to swim with sea turtles. We met at Kikiaola Small Boat Harbor, the Na Pali Experience Boat Tour group’s launching point. There, we met the two other couples who would be joining us on our tour as well as Captain Nate, our captain and tour guide for the evening. In this regard, I think we were very lucky. The two couples we were paired with were pretty laid back and easy to get along with. Captain Nate also had a very open and easy going personality, which made for a fun tour. Once we were all on board the boat, we gave us the required safety briefing and then we were off. As we ferried over to where the tour of the Na Pali coast would actually begin, we chit-chatted with Captain Nate. As a native, he was very informed about the area, talking about the history, pointing out how the landscape had changed over time, and much more. In particular he would point out long red spots indented into the cliffs where waterfalls used to run. According to Captain Nate, in those specific spots, water no longer runs because it was diverted to use for watering crops. However, even though there aren’t any waterfalls in those spots anymore, people say that some good came out of it. The red dirt is no longer falling into the water, making the water all murky. If it were still dirty, the dolphins and turtles wouldn’t be in this area. Plus, there are still several more waterfalls throughout the Na Pali area. Once we made it to the Na Pali coast, I found myself in absolute awe. At the beginning of our tour, the cliffs were about 1,200 feet tall, which is almost the size of the Empire State Building. As you go down further along the coast, the cliffs get as tall as 2,000 and even 4,000 feet. EXTRA: These cliffs also look amazing from the sky! Check out the photos on this Kauai Travel Blog to see what it’s like to take a helicoptor tour around the Na Pali Coat! As we went along the coast, we also went into many of the sea caves. The first cave was cool because, once you get through the arch that leads into the cave, you find that there isn’t a ceiling. For this reason, it’s called the Open Ceiling Cave. Another one of the caves actually had a huge waterfall that dropped inside of it, and another was often called the pirates cave because, when its low tide, the inside looks like a skull. In one of the caves, captain Nate even blew into a big conch shell so we could see how it echoed inside the cave. 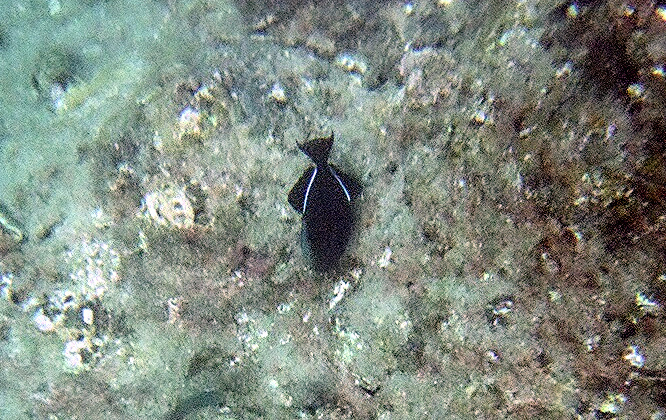 When we were done exploring the Na Pali coast, we made our way back closer to the beginning of the tour, and then it was time to go snorkeling. 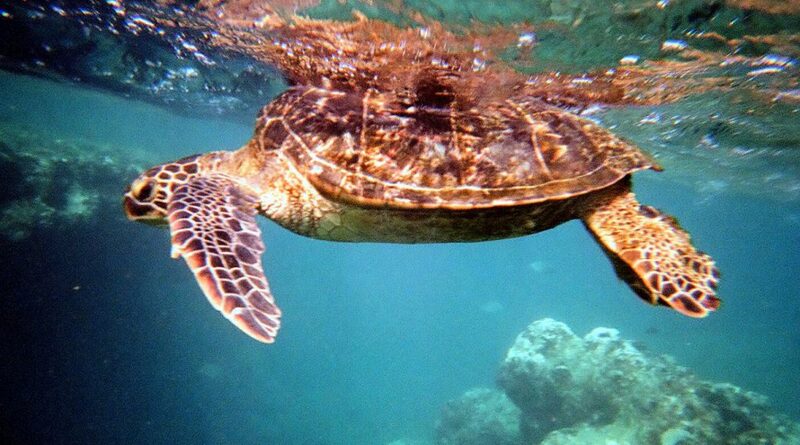 I’d never been snorkeling, and to be honest, it really hadn’t been something I was super excited for. Snorkeling had just been part of the package and wasn’t the main reason I had booked this tour, but since they were doing it, I decided to go ahead and give it a try. Captain Nate provided us with our goggles, snorkels, and flippers, and then we were off! I’ll admit, for the first few seconds I was in the water, I wasn’t a fan. 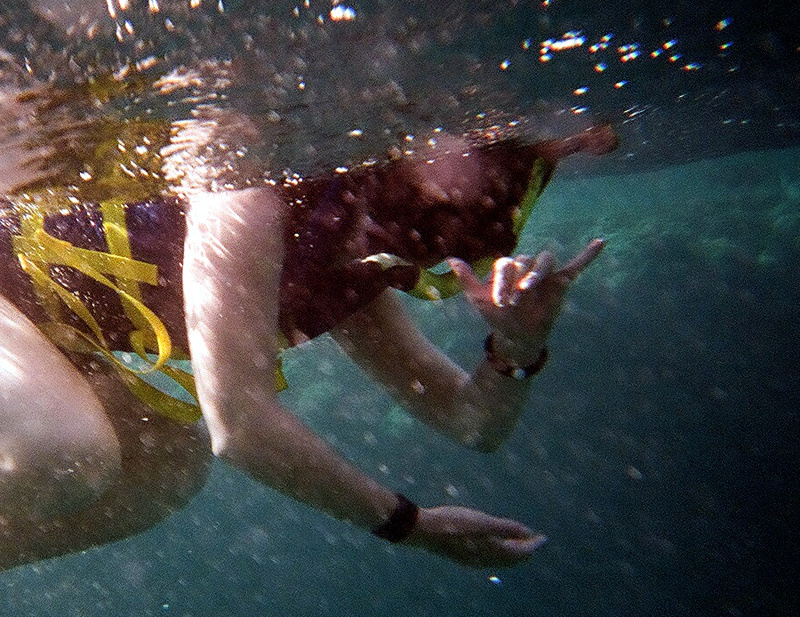 My life jacket helped me float so I didn’t have to worry about that, but when I put my head under water, the mask would suction to my nose and I couldn’t seem to get adjusted to breathing through the snorkel. However, I was way to stubborn to give up that easily, so I forced myself to relax a bit and give it another go. Thankfully, there was plenty to see under the water, and I soon forgot about everything else. My body did it all naturally. According to our captain, this spot was one of the best for snorkeling, and I totally believe him. 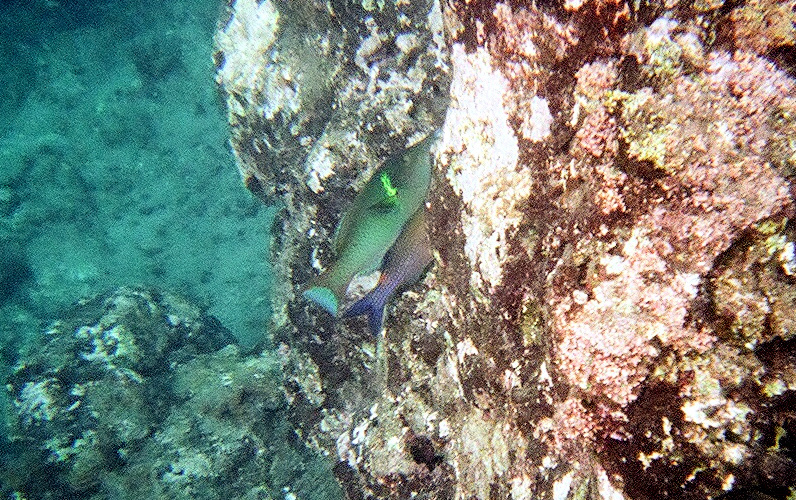 We were right along a reef, so there were plenty of fish around. There were all sorts of cool colored and shaped fish. 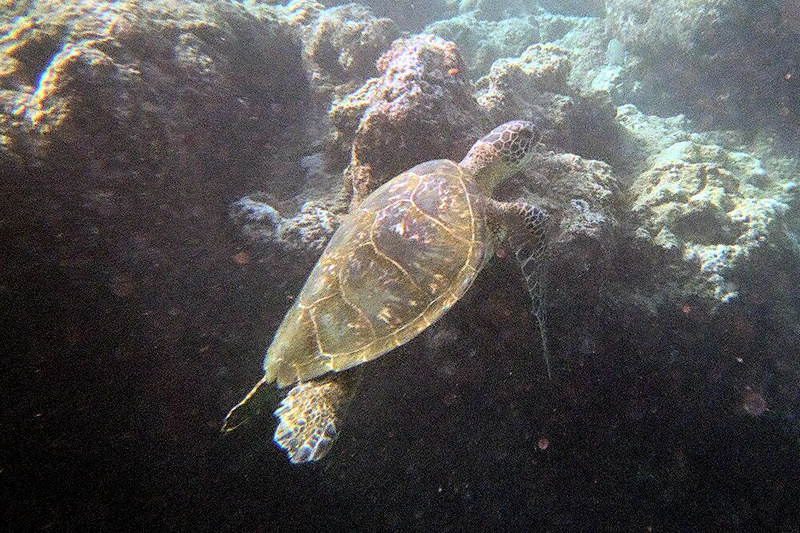 Some swam by themselves while others swam in schools, looking for food along the reef. A little further, there was a big drop off before a gigantic reef that sort of formed a wall. There I found some turtles. There wasn’t just one or two there, but several, and they didn’t seem overally afraid of humans. Some came to the surface, briefly poking their heads out of the water, and I took that moment to get even closer to them. If my arm had been just a few inches longer, I probably could have touched one. Then, they started heading back down into the water, and I did my best to follow them, often having to remind myself that I had to stay on the surface of the water in order for my snorkel to work properly. Thankfully my life vest kept my afloat when I forgot that I needed to, but oh how I would have loved to dive down deep with the turtles! I ended up heading back to the boat before I was really ready to be done snorkeling. 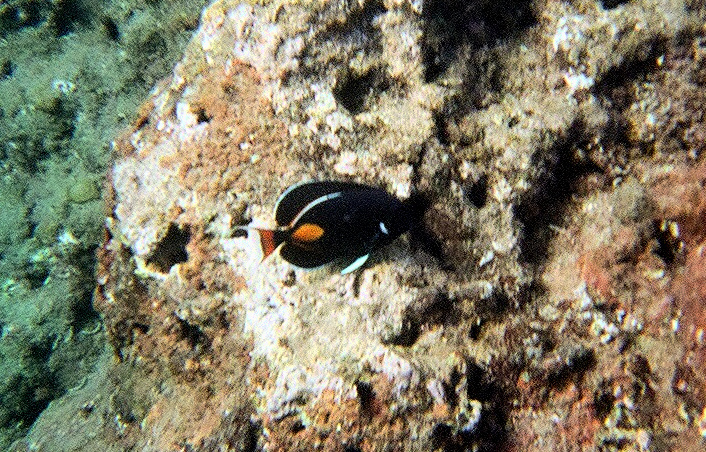 I had bought a disposable underwater camera to use to take pictures, but unfortunately I really only get about 25 photos. After I used all my pictures, all I could think was “man that would make a great picture, I wish I had another camera.” It was practically torture, so I decided to take one last moment to appreciate how absolutely amazing it all was, and then called in quits. Even after getting back on the boat, I was still stunned by how cool the experience had been. It’s not like I had been looking at a turtle lazily lying on a rock in a fenced in enclosure in the zoo. I was actually in the water with these creatures, seeing them in their natural habitat, and I had a front row seat to it all! Once everybody was done snorkeling, sadly it was time to return to shore. I was sad to say goodbye to the spectacular scenery, but happy that I had been able to experience it all. 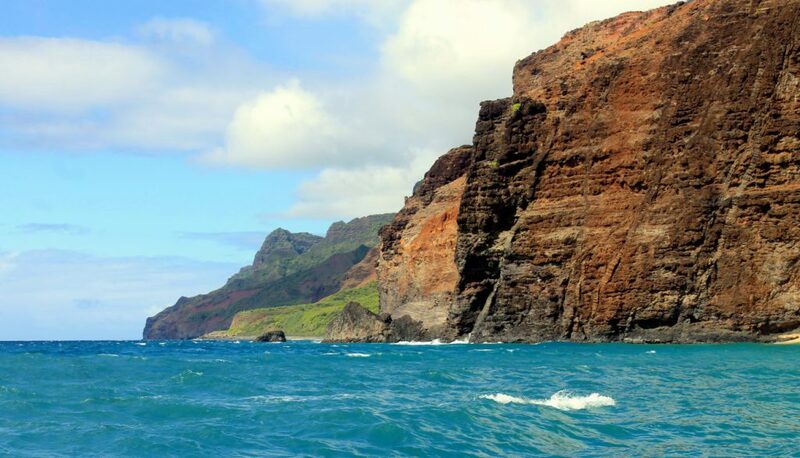 Have you ever done a Napali coast boat tour? What were your thoughts? If you haven’t is this something you’d love to do in the future? Let me know in the comments below! Are you ready to start planning your trip to Hawaii? 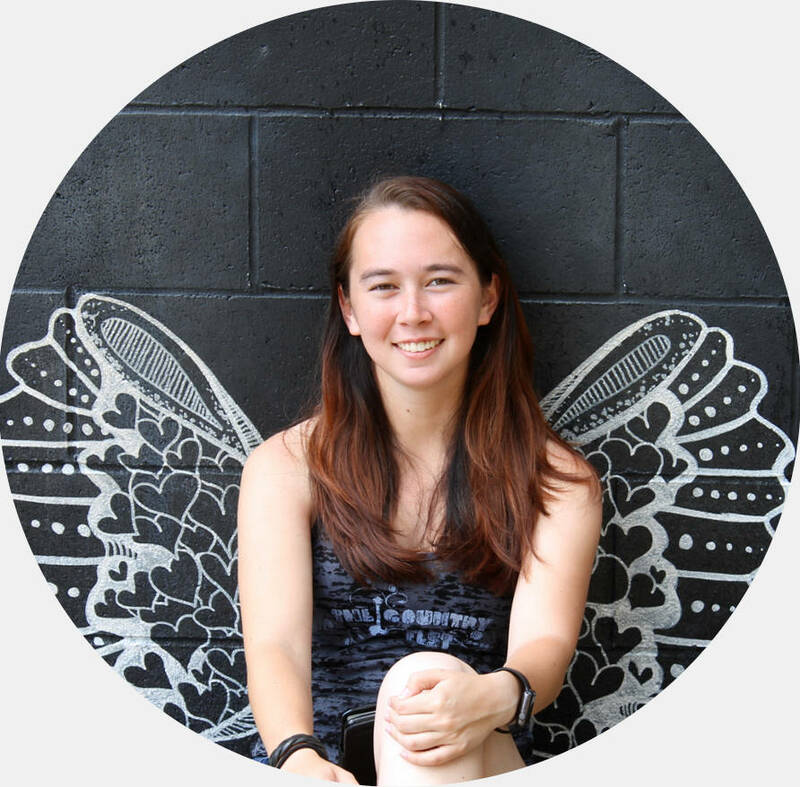 Looking for more Hawaii travel inspiration?